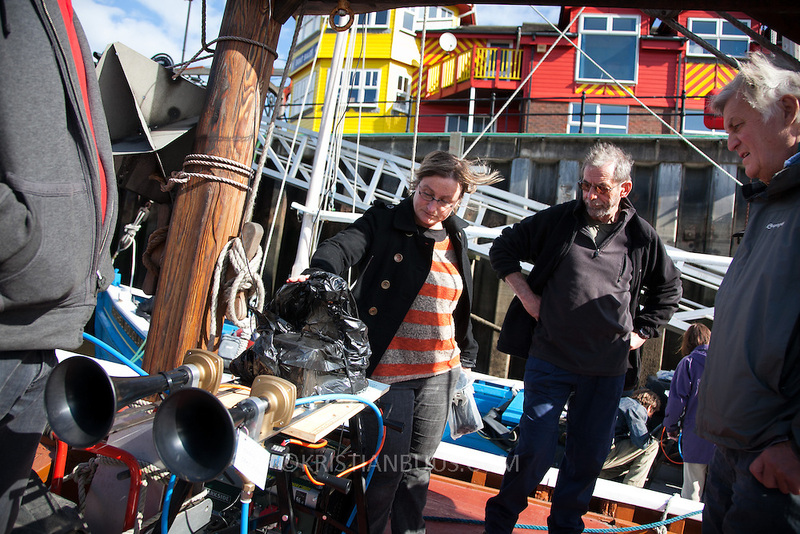 Lise Autogena shows the captain of the ship Sovereign how to work the installed fog horn controle box. Preparations of the Fog Horn Requiem a few hours before the concert is about to start. Last minute installations and adjustments in the workshop and on the ships participating with remote controled horns. A REQUIEM FOR THE FOGHORN, PERFORMED BY SEVENTY FIVE BRASS PLAYERS, A FOGHORN AND AN ARMADA OF SHIPS PLAYING THEIR COSTUMISED AND REMOTE CONTROLED FOG HORNS. A project by Danish artist, Lise Autogena, in collaboration with Joshua Portway and composer Orlando Gough. The performance took place by Souter Light House by South Shields, UK with thousands of spectators and more than 50 ships off-shore.